I don’t understand much about Christians. I really don’t plan on digging too deep because the Bible repeats itself. Also because it talks about sin, yet it has a lot of sin it. It tells you is ok to do things concerning your kids and your wife that are just plain wrong. Now a days people just pick the parts of it they want to believe in and forget the stuff they know is wrong. So why is part of it right and part of it wrong? Then they say that God says this or that when he didn’t. They try to figure out what God was really saying and it’s just what they think it means. It’s screwed up. So I feel this is something I will pass and not rack my brain on why this was allowed and that wasn’t. How so many people have been brain washed I just don’t understand. I’ve never understood. It’s not common sense. They want you to believe stories actually happened that science says is impossible. They just want to say is a miracle. No, I can’t wrap my brain around that. I’ve tried but something always comes up. There are a lot of questions that could be asked but you won’t get an answer to all of your questions, of you’ll get the same answer but with different wording. Crazy. The Bible has too much sin in it for me to believe it. I don’t pay attention to what the Bible says is a sin. When I got arrested there was no way I could blame anything on my cousin, the one who had the gun. I have my own mind so whatever was going on it is my fault. No ifs, ands, or buts. A lot of people don’t want to be responsible for their own unhappiness. They don’t want it to be their own fault. Especially in here. They want what happened to be someone else’s fault. Many people don’t care about the actions that brought them unhappiness. They don’t take responsibility. My cellie tells me it’s all part of “God’s Plan”. Like God planned for him to be here. He’s 50 and he’s been here since he was 22. I don’t know what is wrong with this nut. Maybe it’s the only way he can deal with it. No one knows what happens after you die. I’m not afraid of dying. But it hurts me to think that when I know that I don’t know my son yet and he don’t know me, either. It’s hard for me to understand when I speak to others about different religions. It’s because each religion is different but they have some of the same people in their books. 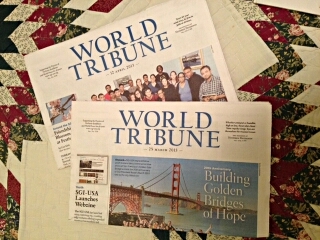 I got my first two issues of the SGI-USA newspaper, The World Tribune and an issue of Living Buddhism. Maybe they will help me with some of the questions I have about my life. Thank you. Everyone should treat people the way they want to be treated. Christianity talks about that but I don’t see people really trying to live that way. In this Buddhism you talk about it seems they take it more seriously. They tell you why you should treat people the way you wanted to be treated. They don’t just tell you that you should do it. And no one thinks about when they are doing something. They get caught up in trying to show off. It’s always that this person or that person isn’t cool so let’s do something to them. They don’t think about what happens when they do that. It’s just like living for the moment and not caring about the outcome. A lot of people are suffering in many ways. Yes, I help others, but what about me? I’ve wasted seven years of my life. To be truthful, I don’t know anything. Yes, obstacles. I understand that they keep you down. Things happen that try to keep you from being happy. How do we get away from that? I guess I got a long way to go. There is a lot I need to accept. Starting with the fact that me and Jamie will never have a real bond. I have to accept that, which is why I let him live his life. He’s happy, so good. Writing won’t do no good. You and I both know this. I have come to learn to accept everything. As I said before, my life is a waste, always has been. So tonight I’ve learned to accept it all from day one. I’ve learned a lot from you. You’ve cared for me. But I finally snapped and realized I’m not ready. I’m not coming home no time soon. I LOVE YOU SON. Please give me some time to think.